I completely agree with Sister Jean I would work with a statue and photos of the father along with a glass of water and a candle on the altar as the starter items. Add items as you deem fit or moved or learn about adding. You may find this work area expands and more family members come along. Example: When I started a while back praying to a specific few, suddenly other member's names of the family started to pop up and it's an old Euro name you dont hear modern day. Incense is nice to burn as well as offerings such as coffee, liquor, items they liked. Spend time in prayer and listen. The gate keeper is the spirit of the first person who was interred into the graveyard. this spirit can help you find the graves of spirits who may be able to help you. When you enter or leave the cemetery throw 3 dimes at the entrance for the gate keeper over your left shoulder. I was taught the same way as EdwardT except we called it the spirit of the graveyard, same concept they watched over the graveyard, you prayed as you entered for the spirit to assist. I toss a coin as good faith then when leaving as I exit I pay as well asking the spirt to prevent any uninvoked spirits from leaving with me and pay the spirt as you leave. This is a very common belief in many traditions. I shared this tradition with a good friend one day when we went into a graveyard together. She had never heard of it and thought it was wild. She went home and shared it with her family and about a week later she came back surprised to find out her syrian family also had similar beliefs about the graveyard. Depends on your tradition or how you are moved. I pray when I enter asking the spirit of the graveyard to protect me while im in there, I ask for guidance to the grave. If you take dirt or bury something with the dead you pay with a dime. You also may pay spirits with things they like examples include: whisky, cigar, cig, coffee, playing cards, candy, food. Would you be considered a Natural Born Necromancer if You communicate With the Dead? Demons? It would be considered a spiritual gift that you have. I'd like to contact my ancestors. I want to do this right. I've read 1st and for most I must give water to the earth. I tried communication last night. I used a white candle and a glass of water. I sat and looked in the mirror. Nothing happened. I said thank you anyway. I want to try again tonight. This time, I'll add flowers. How do I end communication? Did I do right by simply saying thank you? Please, be patient with me. I'm very new at this. I'm learning day by day. At present, my money, is real funny. So my supplies are limited. Have you read through the posts in this very thread? There are nine pages of information and advice on working with your ancestors. In the future, please read through a thread before posting questions as chances are you will find the answers you need before asking. Giving water to the earth sounds more like Gaianism, and this is a forum for the practice of hoodoo. Whether you wish to add elements of other spiritual traditions to your work is up to you, but we can't offer advice here on how to do it. Thanking ancestors is as easy as you described. You could give them an offering, something they may have enjoyed in life (like coffee, candy, flowers, etc.). Please read through this thread and if you then still have questions, just ask. Yes, I did. With all do respect. I'll just stop asking questions. No, don't stop asking questions. If you've read through this thread and still aren't sure what to do, then ask us here. I couldn't answer your question about non-hoodoo practices, but otherwise what do you still have questions about? I practice necromancy (another word commonly used for mediumship) quite frequently and I always go through one specific ancestor/guide first, to help me find my way around. I've been doing this for years and I still use this method of channeling through him specifically, to this day. It's helpful to find one guide that you can build a trusting relationship with so you always have a home base so to speak. It'll just take time though, either way. I personally think you did a great job. Things happen in their own timing with this sort of thing. You'll be stuck for a few sessions and then one day, you'll just see things or hear things or get a completely brand new idea about how to work. It's something that just opens up one day and stays open, but I don't think it's possible to find it on your own. I think it's more that it's "shown" to you. But the quickest way to "find" it, is to just keep trying for little spurts as often as you feel comfortable with. And from my personal experiences, your intentions are pure and you have a good heart to try so hard to be respectful and that's the most important thing. You can't help what you don't know yet. And the dead sense your energy so even if it wasn't done word for word by the book, as long as your intention was to be respectful, you come across as showing full respect to them from your energy. The only thing that would hinder you by not understanding, is protective and cleansing measures. At least in my experience, I've noticed that the herbs and waters used for these things need to be authentic and your "intention" to protect yourself is not the same as being actually protected. But when it comes to respect and formalities and what you say to them, just coming from a place of love is all that it takes to connect with them. I swear by Florida Water for protection, cleansing, to have a clear channel, and to anoint my forehead with whenever I feel yucky, even when not working with spirits. They also like it as an offering in place of regular water. They come through more energetically with the Florida Water around. It really works in all categories for this type of work. I wish you lots of love and protection though, through your journeys, and I would be happy to hear how this unfolds for you! Working to communicate with ancestors can take a bit more time then one try. Dont give up! It may take a few times before you feel the connections. Many books and ideas exist around this type of work. In hoodoo you will see many establish ancestor alters, an area to honor them, remember them, communicate with them. Two things I was taught to always have was a candle and a glass of water. From that it can be built on. Other items I included are photos of the loved ones, personal items from them (if you have some), and I will include items they liked such as a cup of coffee, fruit, cakes , smokes. Great answer, JayDee -- i can tell you are a bibliophile! Thank you so much St Martha and St Expedite for seeing my mother-in-law on her way this morning — she had long disease followed by acute problems starting on 1/1. I kept cleansed and used Hoyts Cologne to ground myself (since this was out of town and I had to work ‘on the fly’). I prayed every day for these saints to help and they are good for the wishes granted. Now it is time to pay the pipers, and thank you so much to Miss Cat for your training and sharing knowledge and experience so I can do that. My condolences on the passing of your mother-in-law. May her memory be a blessing. Finally I've bought several books by Miss Cat about root work. To be the best at what I'm doing. One book I read says root work starts with The Ancestors. To honor them, make an alter for them. My grandmother loved plants. So, I took a bamboo plant I have and put all kinds of stones(amethyst, Jade, green Averterine, garnet, etc. I put water out for them and a plate of tangerines, and a three day candle (white). I introduced myself and thanked them. I had a very long conversation with them. Yet, no response. Nothing. I go to them daily. No one knows of my practices. That's why I'm LM bugger boo. I don't have friends who practice hoodoo or witchcraft. I'm alone. I fear if I can't get them to communicate my work will all be in vain. Please help me what can I do to make them communicate? Don't stop speaking to your ancestors. They can hear you. When, if or how they respond is up to them. You need to have patience, and look for signs of a response. Sometimes they are not obvious, often times they are quite subtle, rarely do they happen overnight. Also, when you ask "what can I do to make them communicate?" you are suggesting that you could compel them to speak to you. That's very demanding. Spirits work in their own manner, and you can't "make" them do anything any more than you could make someone in the mundane world do anything they do not wish to do. Please have patience, continue speaking to them and ask for their help rather than try to compel their reply. I had worked a few years ago to try to talk to my ancestors and to use scrying methods and all the things that you're trying for. I was highly intuitive and had a lot of success with Tarot but I couldn't seem to break the barrier to be able to communicate with spirits. I let it go after a couple months of trying and came back to it a couple years later. I had different reasons to come back to it, though. I wasn't trying so much to get direct answers. I was more using it as something like a therapy session where I would just talk and try to sort things out that were crazy in my life at the time. I imagined just sitting there and talking to my grandpa like I had when he was alive. What started happening though, was that I would get visions while I was forming my ideas and talking. They were just in my mind but they weren't my own. They gave me information that I didn't know before. Then, I started being able to hear something like "flows" of sentences. Almost like being in a crowded hall and everyone's talking at a normal volume but you're trying to hear your grandpa only. So you can follow a sentence or two but it'll get drowned out by someone else's conversation after a few seconds. You can just find the channel that grandpa is on and pick up where you left off but it starts to get pretty muddy after doing that 4 or 5 times. Anyway, it all developed without me really trying. I didn't know that that's what I was even looking for. It might be completely different for you, too. But it's definitely an individual thing as to how you perceive what they're saying to you. I feel very strongly that your work wouldn't be in vain if you didn't hear from them in the way you think you should or in the way that others do or even if you didn't hear from them at all. It wouldn't be in vain if you consider it something where you're presenting them your ideas and your thoughts and worries and frustrations with the sole purpose of just having someone to talk to. That's worth it all on it's own. But they'll still find ways to reach you, even if it's not immediate or through direct communication. It takes a lot of the pressure off and lets you be completely open. I've come to the altar with music playing and incense and candles and a lovely ambiance and it was really nice.. But I've also come to the altar mad as hell and bawling so much I couldn't formulate sentences and it was still really nice, just in a different way. For me, it built the bond stronger between myself and the friends and ancestors that I knew personally and from there, it made it easier to see the visions and hear things because it's grandpa and he loves me. Maybe seeing them as the people they are, instead of ambiguous energies that reside in some nebulous far off realm, it might help you to feel them a lot more. My grandpa is here right now, sitting in his chair, making crass jokes that only himself and my dad would find funny lol. Your family loves you too and would be happy to communicate with you I'm sure, but you just have to work out your own code or find the channel they're speaking on. For me, it only came through when I wasn't searching for it so much. But they hear you either way so it wouldn't be for nothing. Thank you so much. I'm in tears. I want to communicate with them because I love and miss them. I know no one loves me like that they do. It's been so hard. I lost my family at 17. I had to become an adult over night. I finally started to heal a year ago. What made healing so hard? I didn't get air before the wind was knocked back out of me. Life's wind. Not having them to hold me and say, "it's gonna be ok, I got your back". Has been a pain so horrible I can't explain. I get so lonely. When I get off work, I tell them about my day. The things I'm trying to accomplish, my goals, my dreams. I tell them I love them and no matter how tough life gets, I'll never give up. I don't have that choice like they didn't. I want to thank you again for reaching out to me. So, I have a quick question: Could I use Indian Spirit guide to communicate with my Native ancestors? My family is Yaqui and Apache, but this seems more aimed at Plains groups rather than Southwest and Desert groups. I think I'm overcomplicating it, but I'm curious. I burn incense and leave offerings to my ancestors already, but I'm curious how I could incorporate this. Yes of course you could use Indian Spirit Guide to contact your Native ancestors. Their specific tribes shouldn't affect your work with this product. You may indeed be over-complicating things so have faith in your work and you should be fine. Does anyone else have pictures of friends that have passed on their ancestor altar? Yes, as well as family, photos of family, items from them that I still own. I have a friend who is in her upper 60s from the south and lived the last 40 years in Detroit, she told me that you never place the living among the dead, in her home the living are on one wall while the dead on the other. You post made me think of that! That is a good question, and the reply i am going to make will be a bit more complex that you may have expected, for it is not a simple "yes or no" question. 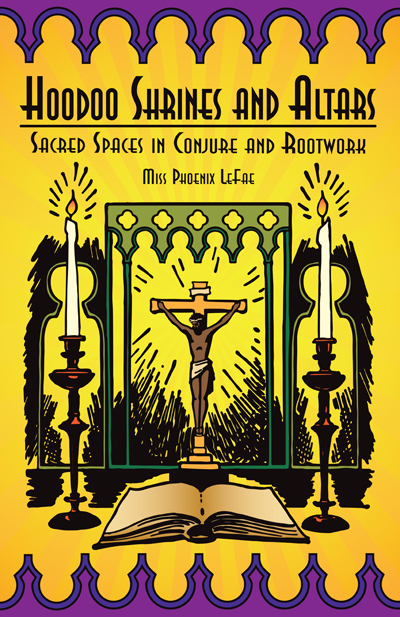 Hoodoo developed in the USA under conditions of Catholic and Protestant Christianity. Most African Americans are Baptists. No form of Christianity endorses what you (and others) call "an ancestor altar." The only altars sanctified in these denominations are those dedicated to God and His heavenly entourage, as perceived within the culture and denomination to which the practitioner adheres. For example, among the Catholics of all cultural origins (including European and African), images of canonized and beatified (church-approved) saints may be placed on both church and home altars, and these saints may include formerly living human beings as well as heavenly angelic spirits. On Protestant home altars, however, since there is no church-designated list of canonized saints, one sees fewer such visual representations. However, Christianity does not exist in a vacuum, and so here we will have to look into African American customs that came out of the pre-slavery African experience. Although many first-generation enslaved Africans were Christians or Muslims at the time of their capture, most of them practiced a local indigenous religion. These indigenous religions are regional and therefore they are varied in their cosmology, theology, and liturgy, but most African religions include some form of ancestor veneration, in which one's worthy ancestors are presumed to require or desire a specific place of veneration at which culture-specified offerings are to be made at culturally-dermined intervals, and, in addition, some especially powerful ancestors are presumed to have been elevated to rank among the heavenly host. You can see the highest form of such elevation of the dead in the religion of the Yoruba people of Nigeria, for example, where Shango is known to have been the fourth king of the Yoruba people, elevated to deific status. You will see it as well in ancient Judaism -- which is one of the reasons some people consider Judaism to be an African religion -- for example, in the parable that Jesus taught about the beggar Lazarus, wherein Lazarus meets and is comforted by his direct ancestor Abraham in the afterlife, Abraham having been elevated to a position near to YHVH, the creator-God. Given the African roots that support the structure of African American Christianity, it is not surprising that the home altars of Black Americans often do include images of ancestors, or that ancestors are honoured in a space that functions as an altar but is not designated as such -- for instance a mantle piece or upright piano top or book shelf on which photos are arrayed, or a place on the wall where photos are hung in great accumulation. These "memory places" do not generally involve conventional African religious sacrificial offerings of food, but it is worth noting that in America, among African-descended Christians, food and other offerings may be made at grave sites. Instead, African American Christian domestic altars serve as places to light candles or to display mementos or to encompass things of beauty such as flowers or figurines. In the context of these African American Christian family memory spaces, it is entirely appropriate to include pictures of people who are not ancestors, such as collateral family members, friends, personal heroes or inspirations, beloved pets or livestock, as well as old greeting cards and calendar prints, and pictures of idealized devotion, such as the image of a child at prayer. These are African American CHRISTIAN altars, and because they are domestic altars, they take the artistic form decreed by the one who establishes them. Now, in recent years, there has been a strong movement on the part of some African Americans, and especially those with a Latin-American family history rather than an Eastern or Southern USA family history, to incorporate elements of Caribbean African Diasporic Religions (ADRs) as well as African Traditional Religions (ATRs) into their lives. Membership in ATR and ADR denominations is initiatic, and at the time of initiation, the adherent is required to undertake certain vows of behaviour with respect to the group's initiated lineage-holders of authority, who in turn grant the adherent "licensia" (license) to worship. In some of these lineages, centuries of a family's Catholic faith may co-exist with preserved, revived, or recreated ATRs and ADRs. Central to these ADRs and ATRs is the continuity, revival, or recreation of -- and a dogmatic insistence upon -- specific forms of ancestor veneration. Within these various religions, there are numerous rules and regulations regarding the physical form and structure of these ancestor altars, with respect to their placement in the home, what images may or may not be included, and how and when specific sacrifical or other offerings may be placed on them. This goes far beyond the African American Christian concept of a devotional and domestic religious "memory place" set aside for ancestors, departed friends, heroes, mentors, and pets. To be clear: the African American home hoodoo way of memorializing the dead is a domestic remnant or retention of an African way of thinking that has for centuries been embedded within the context of Christianity, but the American ATR or ADR ancestor altar is a full-blown continuity, revival, or recreation of an African religion, in all of its clerical and dogmatic parts. So -- and here is why i told you at the outset that i would not answer "yes" or "no" -- it is up to YOU to consult with YOUR religious leaders, YOUR family's way of working, and YOUR own spiritual discernment. Only YOU know YOUR path, and the only logical advice i can give you is to plow the furrow set before you by your own direct experiences of God (this is called "personal gnosis") and / or to work by the rules and regulations set forth (or not set forth) by the clergy of your own religion, if you have one. Thank you, Miss cat, for such an epic and enlightening post! I read it on the subway home from work and nearly missed my stop because I was so engrossed in your words. That was wonderful, thank you. Thank you for sharing that knowledge. That is awesome. Yes, what Sister Jean says. You can also make an Altar Box if you are short on room. Collect items and photos in a box that represent your beloved ancestor, bless and sanctify the box as you would an Altar, and keep it somewhere safe (away from kids, cats and dogs, for example). I've seen lovely Altar boxes, with decopage and applique. Good luck, and bless you.